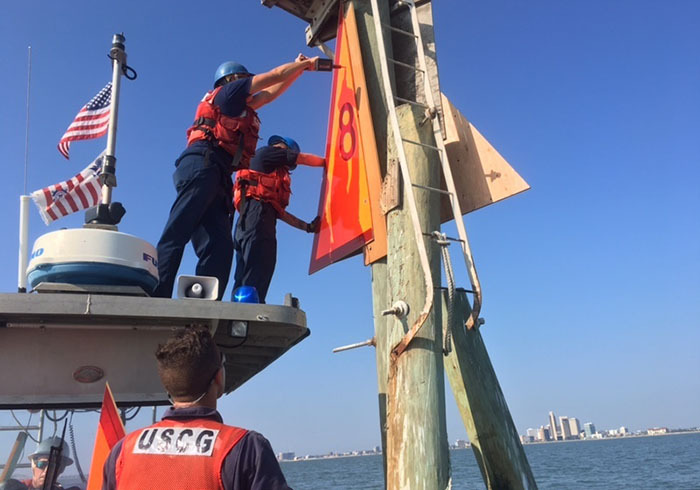 Coast Guard Aids to Navigation team crewmembers replace and repair navigational aids in the Port of Corpus Christi, Thursday. Port Houston plans to reopen its container terminals Friday as limited vessel traffic resumes on the Houston Ship Channel and the region’s freight services take initial steps toward recovery from Hurricane Harvey and its devastating floods. The US Coast Guard also reopened the channel at Corpus Christi, one of the largest US oil ports, to one-way daytime transits by ships drawing as much as 43 feet but said waterway surveys were incomplete and that ships must carry two pilots. The port’s Bayport and Barbours Cut terminals will operate from 7am to 5pm, with a 4pm cutoff for inbound trucks, the port authority said. Breakbulk terminals farther up the ship channel remain closed to vessel traffic but have resumed landside operations. The port authority’s Turning Basin terminal will be open for truck operations Friday. “Employees are on site, facilities are back online, and we are ready to operate,” said Roger Guenther, executive director, Port Houston. The US Coast Guard gave the go-ahead for daylight movement on the ship channel’s lower reaches by vessels drawing up to 37 feet, and at the ports of Freeport, Galveston, and Texas City, for vessels with drafts up to 33 feet. The ports’ normal maximum drafts are 45 feet. Houston officials said they expected three container ships at Barbours Cut and one at Bayport. Most container ships omitted Houston calls and dropped cargo at ports including Altamira, Mexico; Freeport, Bahamas; Mobile; and New Orleans. The port authority said there was no reported damage to containers stored at port terminals, and that free storage time would be extended seven days for boxes that were in port on Aug. 25 before the terminals were closed. The port listed 13 ships that omitted Houston calls because of the storm and its aftermath. Ship management software firm CargoSmart counted 18 that had skipped Houston, which halted operations last Friday. The channel’s partial reopening doesn’t extend to public and private breakbulk and bulk terminals and refineries upstream from Morgan’s Point, near Barbours Cut. “We’re still waiting for the pilots to reopen the channel to allow vessel traffic to our terminal,” said Dan Haeuser, president of Coastal Cargo. Coastal’s Houston facility came out of the storm undamaged, but some flooding was reported in other terminals. The region’s largest warehouses and resin-packaging centers also escaped serious damage. Many areas of southeast Texas remain under water and freight services are struggling to get back on their feet. The ports of Port Arthur and Beaumont, near the southeastern corner of Texas, were closed by severe flooding when the storm made a final landfall Wednesday and headed inland. The Port of Lake Charles, Louisiana, reopened at 3 am Thursday after being closed when the storm passed nearby. Corpus Christi’s inner channel had been reopened to vessels with drafts of 20 feet or less, but the Coast Guard had delayed reopening the port’s main channel, where a drilling ship broke loose and sank a tug in the channel last Saturday. Port officials said they were restoring electricity to terminals and hope to resume full operations by Monday. Trucking companies are resuming operations, but BNSF, Union Pacific, and Kansas City Southern railroads have suspended service while crews inspect and repair flooded lines. Rail service interruptions have complicated resumption of service at area petrochemical plants. The priority list for vessels allowed into the reopened section of the Houston Ship Channel will be set by a standing group of two dozen representatives of the port authority, refiners, terminal operators, and other stakeholders. J.J. Plunkett, port agent at the Houston Pilots Association, said that whenever the channel is shut for at least 72 hours by fog, an accident, or for any other reason, the group agrees which vessels should be allowed to go first in order to meet a critical need such as providing feedstock to keep a refinery or petrochemical plant running. Plunkett said 18 ships were on a waiting list to enter the port and others were expected to be added, but that most don’t fit the reduced draft and operating restrictions. The Coast Guard said it would delay reopening the ship channel’s upper section until it can determine the waterway can be safely navigated. Currents as high as 10 knots were reported on the channel’s upper reaches, which receives water from Buffalo Bayou, one of the main streams that has contributed to Houston’s severe flooding. “Current assessments indicate severe currents and hazards on the upper Houston ship channel from Morgan’s Point inbound to the turning basin; that portion of the channel remains closed for vessel movements until conditions improve and more information is obtained,” the Coast Guard said. Plunkett said pilots would proceed carefully and seek to gradually expand operating limits to include deeper drafts and more of the channel. “There’s a lot of current, and a lot of debris,” he said. “We want to try to get the first ships in and out safely, and then extend it from there.